The International looms, but there's still loads to watch. As you might expect, the Dota 2 scene is extremely quiet this weekend. As the International group stages come to an end (day three is starting right now, incidentally:) players retreat to their training rooms in preparation for next week's main event. Elsewhere in the world of competitive gaming, however, there's lots to enjoy: from a Heroes of the Storm regional to Rocket League's first grand international grand final. GL HF! The best of North American HotS compete for a share of $100,000 and a spot at the Global Championship at BlizzCon in November. Heroes of the Storm has had its ups and downs as an esport since launch, but as Hannah Dwan observes it's become a reliable source of underdog success stories. This weekend's tournament is a good opportunity to see that trend continue. Play began today and continues throughout the weekend starting at 10:00 PDT/19:00 CEST each day. Find the livestream here. Hopefully you're reading this on Friday, because the best Overwatch taking place this weekend is only a few hours away. Some of the best North American Overwatch talent will be battling tonight starting at 12:00 PDT/21:00 CEST with EnVyUS vs. Team Liquid followed by Cloud9 vs. TSM an hour later. Tune in on Twitch. 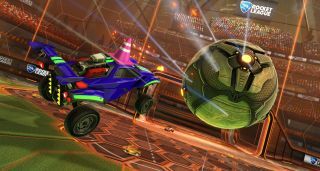 After months of qualifiers, the inaugural Rocket League Championship Series is reaching its final days. There's $55,000 up for grabs for the best players of this nascent esport, with games taking place live in Los Angeles. If you're in the area you can attend live at Avalon Hollywood (details here). The action starts at 10:00 PDT/19:00 CEST on both Saturday and Sunday. Find the livestream on Rocket League's official Twitch channel. There's lots of League season play taking place around the world this weekend, from China to Korea to North America. On Saturday, check out Korea's LCK and China's LPL from 07:00 CEST—22:00 PDT on Friday night for US viewers. Closer to home, play in the NA LCS begins at 12:00 PDT/21:00 CEST. On Sunday, your options are limited to the Chinese LPL with the same timings as Saturday. As ever, further team and schedule information as well as livestreams can be found on LoLesports. This weekend the globetrotting fighting game party bus rolls into dazzling Birmingham, UK. Games played include Street Fighter V, Mortal Kombat, Killer Instinct, Guilty Gear, Tekken and Smash. The majority of the top cuts are being played on Sunday, with SFV and Mortal Kombat beginning at 13:00 CEST/04:00 PDT. You should be able to catch some Tekken and Guilty Gear on Saturday, however, starting at 15:00 CEST/06:00 PDT. This is a ranking tournament for SFV, so expect some top-tier play with a selection of international guests. Find the livestream here.